After six years of trying to start a bike rental program, Baltimore is launching Baltimore Bike Share this week, bringing the city in line with New York, Washington D.C., Rome, Montreal and hundreds of cities around the world that have already established short-term bicycle rental services. A top priority for advocates who see it as a way to make biking more accessible and take cars off urban streets, the program has ignited big interest with the approach of Friday’s launch event with Mayor Stephanie Rawlings-Blake. “Can high schoolers get memberships? How do communities advocate for a stop in their area? Is there reciprocity with other cities? Can employers and institutions buy passes as giveaways/incentives?” were among the questions commenters have asked online in recent days. Already, more than 350 people have plunked down $100 to be “founding members,” locking that annual rate in for life for membership that would otherwise cost $15 per month. Liz Cornish, executive director of the private non-profit advocacy group Bikemore, said her group considers the unveiling of the new Bike Share program a reason to celebrate. 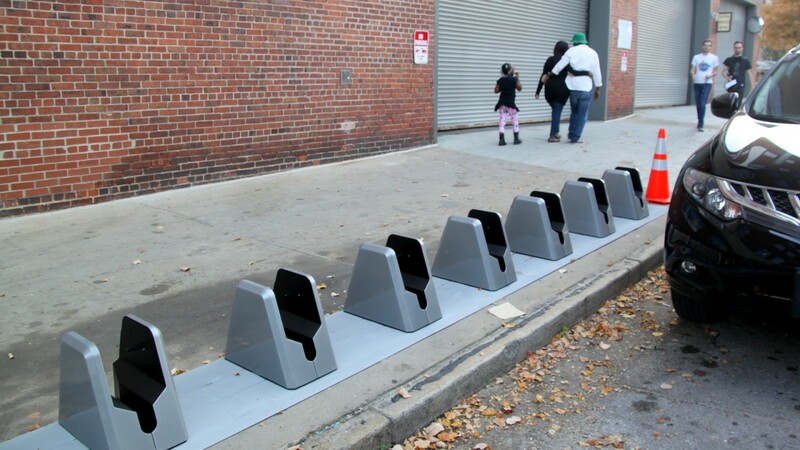 Cornish even finds a bright spot in the at times harsh discussion over equity, which has had critics calling for more Bike Share stations in the city’s majority black neighborhoods. In 2010, the Department of Transportation began readying a bike share program and had even gotten as far as selecting a vendor. But during the 2011 election, Mayor Rawlings-Blake put the initiative on hold, ostensibly because of costs, but also out of concern that the program might be perceived as benefiting tourists at a time when she was proposing to close recreation centers and disband fire companies. Since then, the program was revived two times, but failed to move forward because of problems with the vendors. Now the city has embarked on a plan to make 465 bikes available, about half of them motorized “electric-assist” bicycles. The Board of Estimates has approved a $2.36 million contract with a Canadian company, Bewegen Technologies, to design and install the stations and, through a partner, Corps Logistics, operate the service. DOT spokeswoman Adrienne Barnes said 20 stations and 150 bikes will be available at Friday’s Phase I launch. 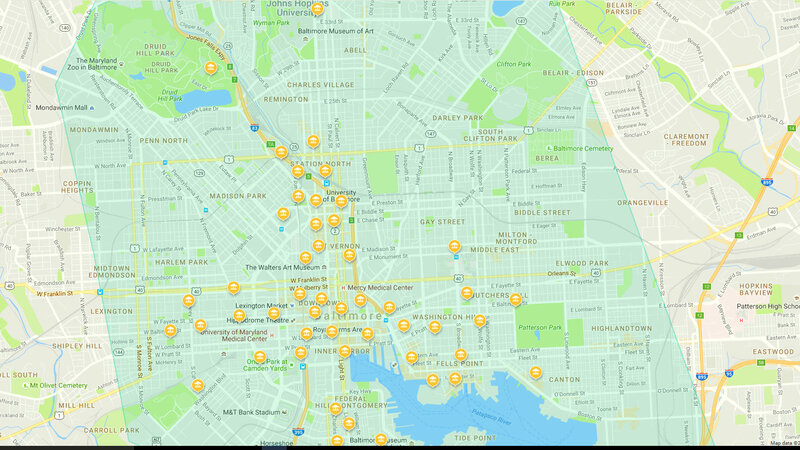 The first 50 stations are identified on the map on Bmorebikeshare.com. As the stations go live they will change from “planned” to “active,” she said. A bike can be picked up at one station and returned at another. “Perfect for errands, commuting, or recreation,” the website says. The cost will be $2 per trip, with one trip lasting 45 minutes. Trips over the 45-minute threshold will cost an additional $2 per half-hour. Monthly passes, available for $15, come with unlimited 45-minute rides. 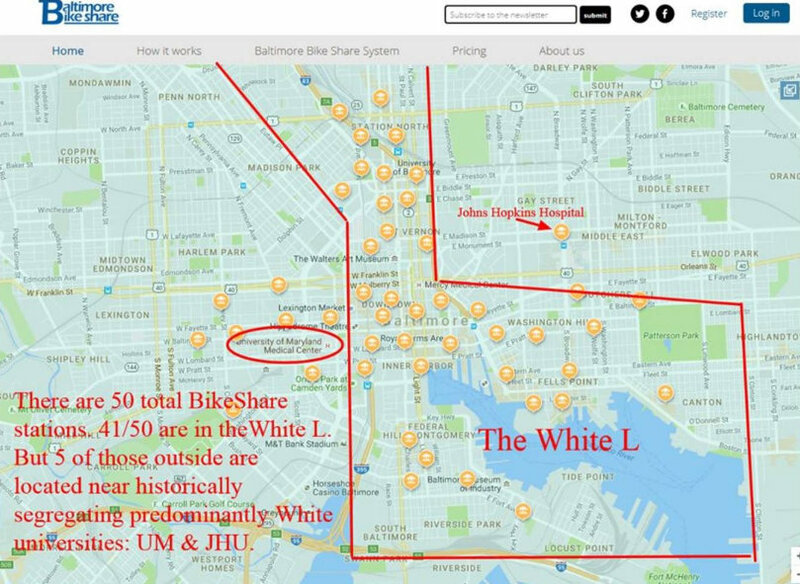 As with the decision on where to place protected bike lanes, the siting of Bike Share stations has also drawn fire from critics who say they mirror the so-called “White L” – the swath of largely white and more affluent neighborhoods that runs on a north-south axis through the center of the city and swings east along the waterfront. “Bike Share perpetuates our transit apartheid,” writes Lawrence Brown, assistant professor at Morgan State University, on his Baltimore Redevelopment Action Committee for Empowerment (BRACE) Facebook page. DOT “has made a conscious effort to keep equity of the system a paramount goal,” Barnes said, responding on behalf of the city. 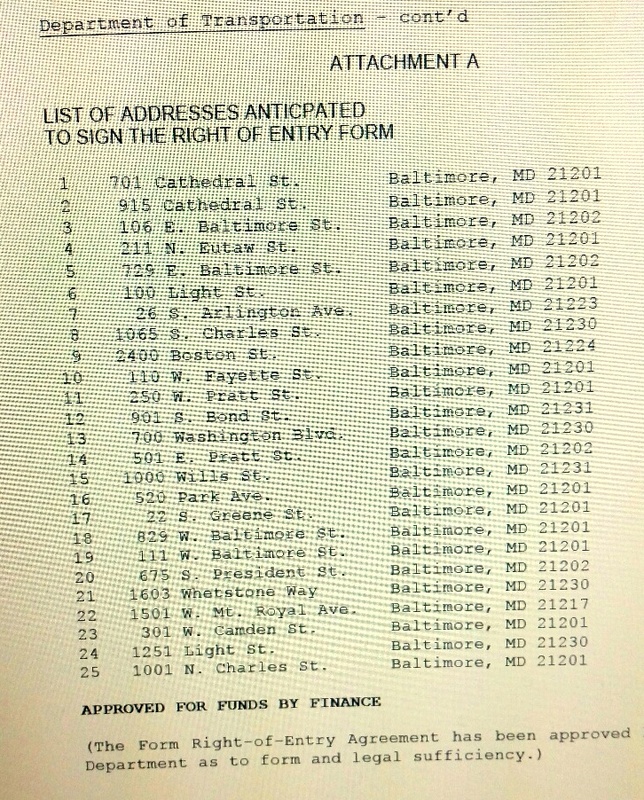 “Baltimore Bike Share will also be offering a cash option for the unbanked population,” she added. The agency held six community meetings to help determine where the first 50 stations would go. Additional meetings are planned in the spring to determine where Phase II stations will go. Cornish said she thinks the critics are raising an important point, but also notes the limited scope of the program. “The idea that a 500-bike system is going to singlehandedly completely undo the issues, like historic housing patterns, that we have in urban planning in Baltimore is not realistic,” she said. Cornish said advocates pushed the city to consider the equity issue, but it was constrained by some practical requirements, including density. “In order for Bike Share to be convenient and to encourage use, stations have to be close together,” she said. Another limitation was logistics and cost. Stations needed to have easy access to electrical conduits and be able to conform to right of way and other requirements in order to keep the costs down. Sponsorship, she noted, was another issue. The city is looking at public or private sponsorship offers. Several Phase I stations, for example, are being sited at Maryland Transit Administration transit hubs. As the sponsor for those stations, MTA assumes the cost. The way Cornish sees it, the attacks on station siting decisions are healthy. “If people want to criticize Bike Share, great,” she said.